Update from Tom - This is now even cheaper. You can use the discount code and the Lightning Deal for extra 15% off to get it for just £18.19. Whether you also encounter such trouble on ironing clothes? 1.Don't know how to deal with full wrinkled clothes in the wardrobe when season replaces. 2.Your clothes will cover with strange smell after cooking or smoking. 3.Using the iron with an instability, accidentally, you might say goodbye to your favorite dress. 4.Up early and great hurrying to work, you don't have time to iron or need to get water frequently due to a small water tank. Blusmart steamer can help you get rid of all your worries. ★6 selectable steam levels to choose, which really makes difficult to iron garments a breeze. ★Can maintain the steam up to 100℃ and 1.5m, powerful to remove odor, bacterial, virus, bed mites, dust etc. 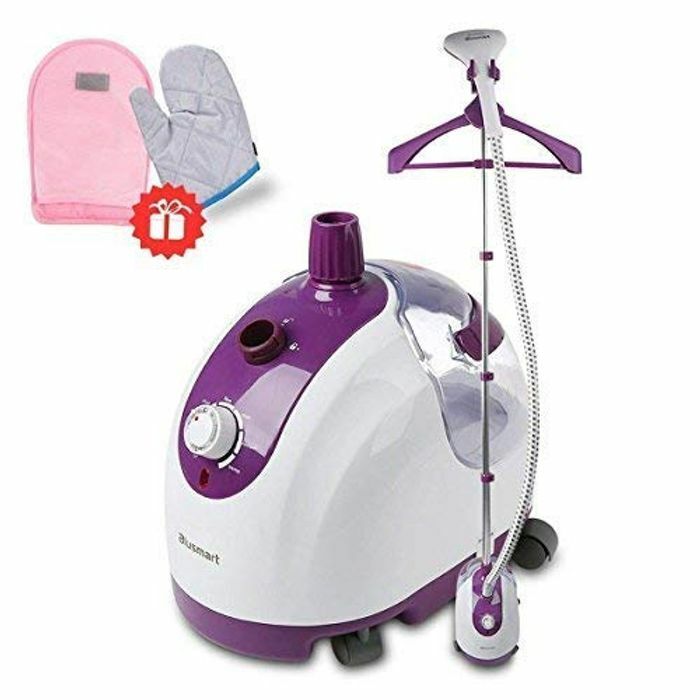 ★Can steams continuously for about 70 mins, emits steam in 45 seconds, 2.2L water tank enables you to save the time and enjoy ironing clothes. ★Designed with the rolling casters, retractable pole and patented drain plug for compact storage and maneuverability. ★when lack of water or overheating, the steamer can shut off automatically. Q: What should i need to note before using? A: Please read the manual clearly when you install; Don't exceed the maximum mark tank when adding water; Please don't too close to the places with warning signs. Q: Does it take tap water and can it shut off automatically when it runs out of water? A: Yes, it is and the steamer can automatically shut off when too hot or runs out of water. Q: How should i do when excessive gurgling of hose and steam nozzle? A: Gurgling is normal during the steam process due to condensation in hose. Please extend the hose vertically to allow water to drain back into the water tank. This price is crazy! I am so tempted and I already have a hand held one. It's going in my basket. Thanks for sharing. Wow what is this ? ive not seen this sort of iron beofre - anyone have one ? Every time I actually get to a deal is one that I don't need lol. Thank you for sharing I was reaaaaally tempted to get one but my partner would kill me! As i want it but dont really need it i am going to take the risk, wait til its on lightening deal and see what happens. Great price already but would be even better cheaper lol. Fab share! I have just purchased this for 17.23! I have a handheld one that I've never even used but I still couldn't resist this at that price! Maybe I'll give it to my sister,who is bonkers and even irons her knickers! So on behalf of her thanks for sharing. How did you purchase it for 17.23? Can I ask you why you don't iron your knickers? They wouldn't be worn in my house unless ironed!! Shelleymac 3 reasons:- 1. Not many people see my knickers. 2. The creases stretch out over my bum and 3.Life's too flipping short! Worked for me. Thank you so much. This will be a big help. Unbelievable price for this not to be missed,thanks for sharing it. This is an excellent price. Thank you very much for sharing it. Fantastic price. If I can use the code provided. I've always wanted one of the these. Watched in envy when seen similar being used in shops. Would be great for superking size bedding & 90xx90 curtains.